It's very quick and easy to make and the result is a two small sized loaves which have a pretty good bread-like consistency. The flavour is ok, it tastes nothing like wheat bread but is vaguely reminiscent. It's sweet and you can taste the tapioca starch. It needs to be kept in the fridge and eaten within a few days and is best frozen in individual slices and taken out when needed and toasted. Pros: It's convenient and quick to make. Good sandwich bread, good for picnics and lunches out. 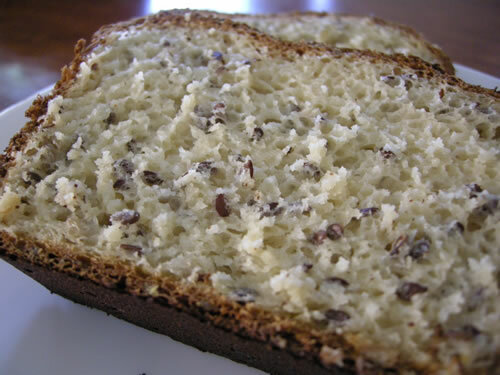 It contains a good amount of fibre and protein and more nutrients than most gluten free breads. Cons: It's not organic. In the ingredients, white rice flour is 1st on the list, potato starch is 3rd and sugar is 5th. It tastes too sweet. It has a tree nut allergy warning.